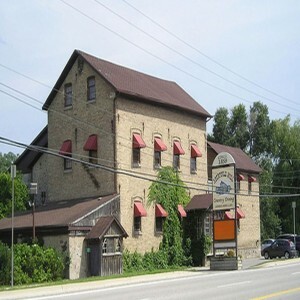 Located just south of Guelph Ontario and two minutes off the 401, the beautiful Aberfoyle Mill Restaurant has been the home base for the Mysterious Players for almost a quarter of a century. Most of our shows take place in the large upstairs dining hall, which seats up to 100 people. For smaller groups, the downstairs space offers a more intimate atmosphere. The combination of a good location, friendly service and excellent food is what keeps us there, and we’re sure it will keep you there as well. For more information about the Aberfoyle, check out their webpage at www.aberfoylemill.com. Our cafe is open for Breakfast, Lunch every day and Dinner on the weekends. We are in bright and early each morning to bake for you the freshest breakfast pastries and we specialize in our unique muffins – eg. Banana Split, PB & J, Peach Mango Crumble, Butter Tart – just to name a few.